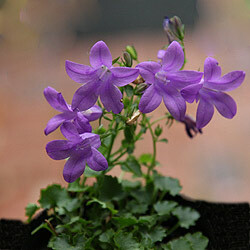 A great little perennial for a raised garden or rock garden, Campanula 'Birch Hybrid' is a cascading or trailing plant that is excellent for raised borders when allowed to trail down over walls. Try growing in a planter, hanging basket or window bow as well. Raised in the UK at Birch farm by the Ingersons this little plant grows well in full sun to part shade and produces masses purple flowers in early summer over 4-5 weeks and if deadheaded may give a second flush of flowers later on. as this is a small growing cultivar reaching only around 10 - 15cm it is best grown in a rock garden or perhaps left to trail over a low stone wall. It also works well in a container. This is a hybrid between C. portenschlagiana x C. poscharskyana and combines the merits of it's parents but is less invasive that either of them. A humus rich moist to well drained soil is best. If you live in an area of poorly drained soil we suggest that you may wish to improve drainage by raising the garden bed as Campanula 'Birch Hybrid' does not like wet winter conditions. Growing well in sun to part shade, although in deeper shade it does tend to become a little 'leggy' and flowering is not as profuse. It can be lightly pruned back to maintain shape although not really needed in good conditions. Propagation is best by division or basal cuttings taken in early spring. Also from seed.